The following are variants of a strip I submitted to the Dominion Dispatch last year. The image was also featured as last year's top bar. I couldn't decide on my favorite punchline, so I made several versions. It's my whimsical way of saying "Happy Canada Day" this year, and introducing Canuck Steampunk, year three. The final version of the top bar, one of my all time faves. Here's Version 1 of the strip, which I think has the best pacing. The Third Version, which makes me laugh - This was the final version I submitted. 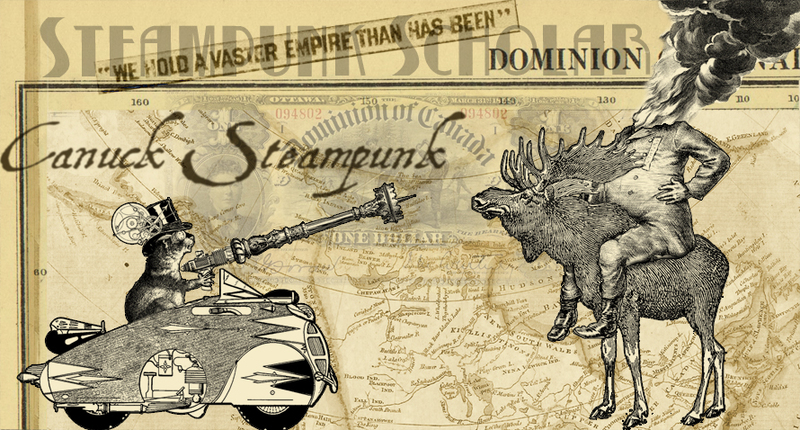 The title addresses why I wrote the strip in the first place, which was to make a joke about how this peaceful Canadian icon (from a nation of ostensible peacekeepers) is driving around with a huge steampunk gun on the front of his car. This was also meant as commentary on the ubiquity of sidearms in steampunk cosplay. We're not sure who we're at war with, but we have guns just in case - even in Canada. I thank Cory Gross and Dave Malki at the bottom of the strip: Cory, because the steampunk Beaver was his idea, and Malki, because I was riffing off the style he renders his hilarious Wondermark comic with.